South High School is distinguished for its exemplary academic programs, dynamic theater and music productions, studies in engineering, visual arts and world languages! We embrace all students and are proud of our diversity. Site Council convened and formally established the ad hoc "Principal Selection Process Committee." Meeting minutes outline where we are. Next steps: Impending release of a stakeholder survey; and Site Council's formation of an interview team. 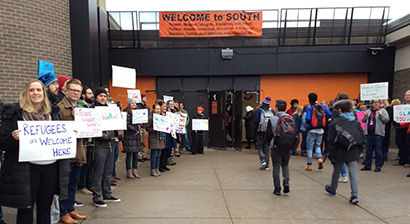 We're looking for representation, that best reflects our makeup of students, parents, teachers, staff and community members, to vet and help select the next leader of South High. Nominate yourself or someone else to serve on the Principal Interview Team by Monday, April 29. FREE ACT test is a week away! Next week, Wednesday, April 24, all South juniors, and some seniors, will report to the South High gym at 7:30 a.m. to sit for the ACT college entrance exam. Read important reminders about what students need to do this week, as well as test day! After the ACT exam, testing students will be dismissed for the day. Students may resume afternoon schedules, but need to check-in with Attendance Clerk, Erica Evans to have their attendance recorded. Expected end time is 1 p.m.; 2:30 p.m., if testing with accommodations. Just added, to teacher-led study sessions for Advanced Placement exams, an April 20, Saturday, Calculus Review, 9-1 p.m. with Mr. Krasean. See all sessions. Do you know where your AP test is? Find out here! The Advanced Placement test schedule has been updated with locations. NEW Log into the portal. Look to the left navigation bar, and click the tab, "Report Card." This will bring up the online view of the same quarterly grade reports that are mailed home. National Honor Society, tonight, will induct a new cohort of sophomores and juniors into the ranks of students recognized for academic excellence, outstanding character, leadership and exceptional community service. Ceremony: Thursday, April 18, 6-8 p.m, SHS auditorium. Testing, MCA, Opt Out, etc. Tuesday, April 30 6 p.m.